The medium size Class ABB cells tester combining solar Simulator and light soaker from Solaronix, featuring our genuine Lumixo light engine. High performances in a small cabinet. The Xenonless Xenon lamp maintenance free solar simulator system and light soaker combined. The Solixon A-70-TE is a class ABB or ABA Solar simulator intended for continuous operation (24/7). This equipment also can work as a light soaker as it is intended for long duration operation. This system is a complete current-voltage (I-V) measurement environment for the most demanding user. All equipment is configured in our factory to reduce the setting costs at the customer site. The computer and software are fully installed and configured to be ready after unpacking and connecting. 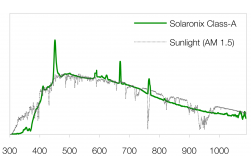 The long lifetime Lumixo light engine from Solaronix generates a continuous light spectrum corresponding to a class A spectrum. This system is designed to illuminate any type of solar cell. 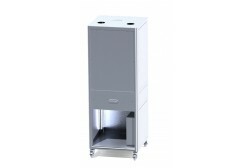 The Lumixo light engine is illuminating the 70 x 70cm sample area with an irradiance non-uniformity within class B and temporal stability within class B or A. 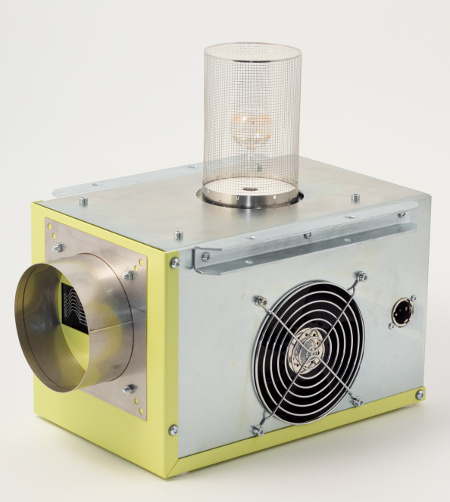 The system consists of a light engine fit into a reflector box (diffuse illuminator). A 15 mm to 200 mm wide access gap is granted between the sample area and the reflector bottom to accommodate any sample type. The illustration shows a simulator version with a small gap for thin samples. Spectrum: Class A as per IEC 60904-9. Irradiance: 700 to 1200 W/m2. Irradiance uniformity: Class B or better as per IEC 60904-9. Class ABB or ABA specification is guaranteed in the irradiance range from 800 to 1100 W/m2. Lower irradiance settings may reduce the characteristics from class ABB to BBC or ABA to BBB. Irradiance temporal stability: Class B or class A (option) as per IEC 60904-9, if the room temperature stays constant. The characteristics are measured with the illuminator loaded with black material (e.g. «Rosco» black foil), if no optical load is provided by the customer. - A thermostated table (sample holder) made of anodized aluminum plates having an internal thermo-electric cooling system. Tiny holes on the top surface are provided to form a vacuum chuck if connected to an external vacuum pump. The vacuum pump can be supplied by us, as option. 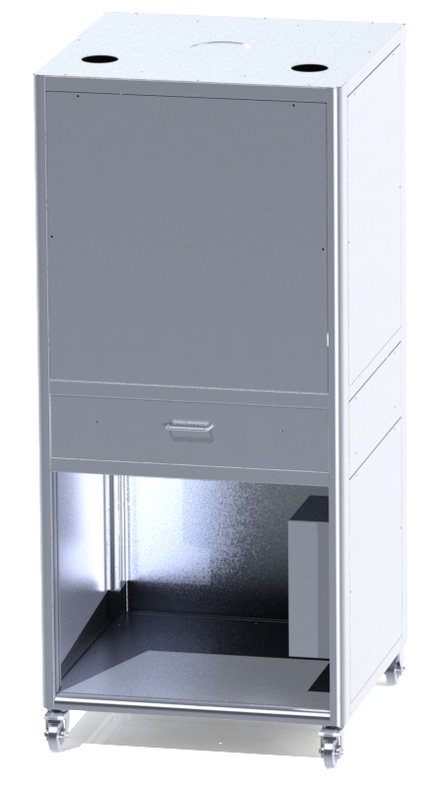 The thermostated sample holder can be maintained at a constant temperature (+/- 2°C) between 20°C and 55°C when loaded with a light absorbing sample and the lamp power set to 1000 W/m2 irradiance. Due to the vast variety of solar modules and encapsulation types possible, it is strongly recommended to provide us with actual samples, so finer temperature specifications may be given for the sample holder. Absolute minimal specifications are the light-soaking test conditions as per IEC-61646: 50°C +/-10°C for a minimal illumination set to 600 W/m2. 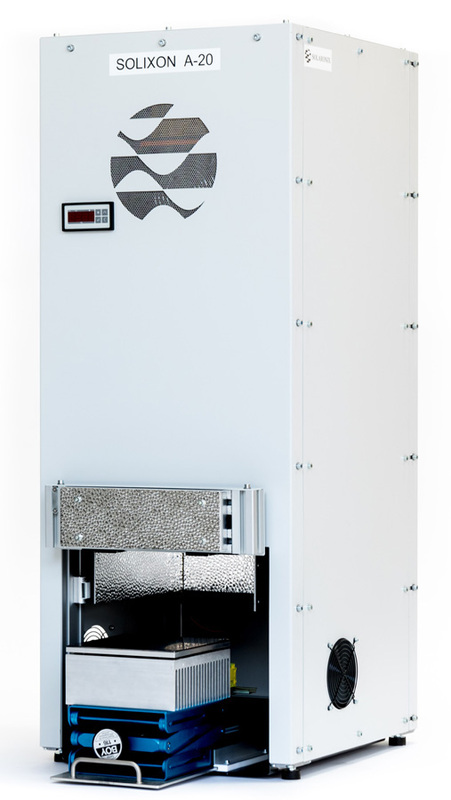 Unless otherwise agreed in the acceptance tests, the module temperature is measured with PT100 sensors attached on the back side of the module. No thermal specifications can be given for a margin of 3 cm inwards to the panel rim, neither on the junction box area. Detailed mechanical drawings of the test modules, or a representative sample, must be provided by the customer before order confirmation to ensure best equipment fitness. The light engine is a “Xenonless Xenon” lamp system. The light engine is based on plasma lamp. This lamp equips the new generation of maintenance free solar simulator. Comprehensive documentation is provided with the system, including operation manual, software manual, and the necessary electrical and mechanical schematics for maintenance. No particular safety means are necessary for system operation. Direct view to the light source is prevented by the system design. UV protection glass is provided with the system. 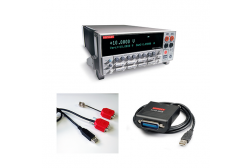 Our I-V System Basic is built around the well-known Keithley 2401 Source meter. This proven instrument has all it takes to measure I-V curves (both dark and illuminated) on solar cells. The available current range has a minimum of 10 pA and a maximum of 1A, where the voltage ranges from 1μV to 20V. Unlike the more expensive Keithley sourcemeters that interface by USB, this instrument can only be controlled by a GPIB interface. In our basic I-V System we include a GPIB/USB interface for computer connection of the sourcemeter. When measuring solar cells, it is very important to use a thermostated sample holder, to avoid measurement due to thermal drift of the sample. Another important parameter for solar cell metrology is the temperature. A high precision, class A Pt100 temperature sensor including computer interface (USB) is provided with this basic IV-System. Please note that the Tracer I-V Curve Software is required to operate the I-V System Basic. Our I-V System Pro is built around the well-known Kepco Bop bi-polar power supply and 3 Agilent DMMs to realize high quality data acquisition on current, voltage and reference cell. These proven instruments have all it takes to measure IV-curves (both dark and illuminated) on solar cells and modules. The current range is ±4A, where the voltage range is ±100V. Other ranges are available on request. When measuring solar cells, it is very important to use a thermostated sample holder, to avoid measurement due to thermal drift of the sample. Another important parameter for solar cell metrology is the temperature. A high precision, class A Pt100 temperature sensor including computer interface (USB) is included with this professional I-V System. Please note that the Tracer I-V Curve Software is required to operate the I-V System professional. 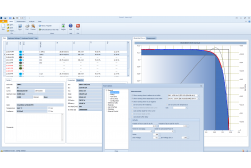 A powerful software named Tracer, controlling the electronic load, allows a user-friendly operation, going from simple current-voltage (I-V) plot tracing to more advanced device characterization. It seems logical for this measurement to use a standard power supply, because a power supply is normally used to provide a variable voltage and current. Unfortunately, this would not work for solar cells. A solar cell generates current, so you will need to have a power supply that sinks this generated current instead of provide it. This can be done with a so called bi-polar power supply (or electronic load). This is a power supply that can sink and source current at both positive and negative voltages. There are many instruments on the market that can be used a such a bi-polar power supply. Some of them are just bi-polar power supplies while others integrate measurement and control capabilities as well. Tracer will let you define and setup a system based on different instruments to measure your I-V curves. You can add multiplexers to automatically measure multiple cells by using one single measurement system, implement contact checking and measure monitoring solar cells. Of course Tracer natively supports the control of all Keithley 2400 and 2600 series SourceMeters. These instruments have proven their strength over time for the measurement of solar cells. They range from 0.1fA – 20 Amperes. Tracer is developed with the latest Microsoft.NET Technology, which resulted in a modern ‘Microsoft Office' look and feel. A stable operation on the Microsoft Windows platform is guaranteed (Vista or higher). Other popular platforms like Linux and MacOS will be supported in the future. The High Resolution Solar Cell Probe is a precise probing unit enabling accurate current/voltage measurements on solar cells. The High Resolution Probe is designed primarily for probing targets of approximately at least 13 microns in size at a 80 TPI resolution (320 μm per 360° turn). It is available with a magnetic base in either left or right hand models. The 125 mm x 125 mm scanning area allows positioning on a broad range of solar cell materials. Each axis is spring loaded to prevent backlash, and the control knobs are conveniently placed at the rear of the micropositioner to allow one hand control over three axes at the same time. 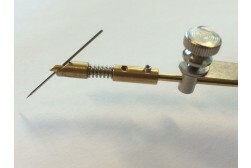 The probe mount is electrically isolated from positioner body. The High resolution Solar Probe can be used in a true 4-wire Kelvin configuration. This means that the possible voltage drop over the current wire is eliminated by measuring the voltage at the sample directly. The wires are electrically isolated from the body. To measure a solar cell in 4-wire Kelvin configuration a second Solar Cell Probe or a base plate with voltage sense is required. - Spring tip holder is very robust and accepts any of the available probe tips with shank diameters ranging in diameter from 10 to 25 mils. - No special tools are required for loading and unloading the tip from the holder. 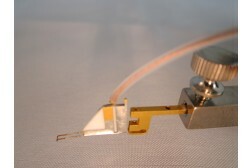 The standard crystalline silicon reference cell manufactured by ReRa is a high-quality precision sensor for the determination of solar simulator irradiance levels. 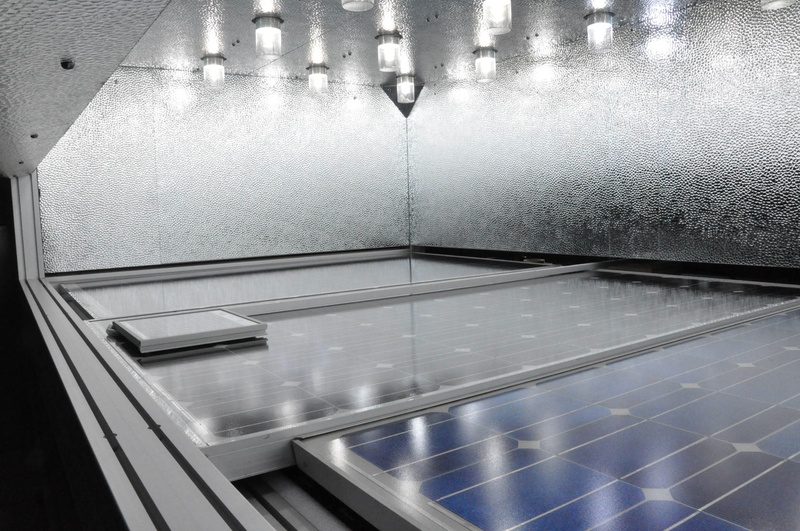 ReRa uses the Radboud University Nijmegen PV Measurement Facility to calibrate the cells indoor. The calibration is done against an established set of reference cells calibrated at NREL and Fraunhofer ISE. These references are measured each year at the spectroradiometer and broadband intercomparison to ensure traceability. - Several filter options (KG# window) to match spectral response, KG number to be specified at order. All reference cells can be ordered with a KG3 or KG5 window for measurements of specific cell materials. Our engineering team is looking forward to receiving your inquiry, and is ready to assist you in determining the best equipment for your application. Send us a quotation request by clicking the "Ask For a Quotation" button above. Feel free to use the comment textfield for telling about your requirements.